Motorola Mobility today announced two new affordable smartphones: Moto E4 and Moto E4 Plus, both partially made out of metal. Obviously succeeding the Moto E3 series from last year, the Moto E4 and E4 Plus will be released later this month in the US and various other markets. 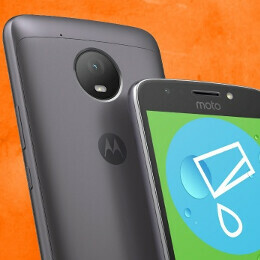 Running Android 7.1 Nougat out of the box, the Moto E4 and Moto E4 Plus are protected by a water-repellent coating, and differ mainly when it comes to size and battery capacity. Measuring 144.5 x 72 x 9.3 mm, the Moto E4 sports a 5-inch 720p display, packs a 2800 mAh battery, and is powered by an octa-core Snapdragon 427 processor (or Snapdragon 425 on some models). The handset has a fingerprint scanner, further offering 2 GB of RAM, 16 GB of storage space, an 8 MP rear camera, and a 5 MP front-facing camera with its own LED flash. The Moto E4 Plus sports a 5.5-inch 720p display, and packs a pretty big 5000 mAh battery - thus, it's larger than the regular E4, measuring 155 x 77.5 x 9.55 mm. According to Motorola, the battery of the E4 Plus can "go for 2 days" without recharging. Like its smaller brother, the E4 Plus is powered by a Qualcomm Snapdragon 427 processor aided by 2 GB of RAM, though it will have variants with 16 GB and 32 GB of storage space. Also on board are a fingerprint sensor, a 13 MP rear camera, and a 5 MP front-facing camera with LED flash. Motorola plans to sell the Moto E4 Plus for $179.99 (or €199 in Europe), and the Moto E4 for $129.99 (or €149 in Europe). The regular E4 will also be sold as an Amazon Prime Exclusive Phone, at an even lower price - but this means it's going to feature Amazon ads and offers on the home screen. The Moto E4 series seems to be a worthy upgrade over the Moto E3 and Moto E3 Power when it comes to both design, and specs (as you may know, Moto E3 phones are plastic-made devices powered by MediaTek processors). Let us know if you're interested in buying a Moto E4 or a Moto E4 Plus, will you? Where does it say this phone is metal? I highly doubt it. Also the battery is removable. If that is the case and it has AT&T bands, I'd take a Plus in champagne color in a heartbeat. 1st. Nobody needs nfc, not at this price point. 2nd. This is the replacement for the G play and what it always should have been on the first place (aka, there never should have had a G play) If it has all the Moto actions (unlike the G play) I believe I will be buying one.